comScore Direct is a self-service portal for managing the measurement of your content – including web pages, online videos, mobile apps, ad networks and distributed content. When you register for comScore Direct, you control how your entities are reported by comScore because you organize and initiate the tagging process. Register for an account and receive your own customized tags. After your tags are placed on your content, comScore Direct provides an easy interface to track and validate traffic counts on a daily - even hourly - basis, giving you confidence that your assets are reported accurately. What content am I able to tag in comScore Direct? comScore Direct allows you to tag all your digital assets, helping provide a complete view into content consumption across various channels and content types. Website: Understand visitation to your web content and analyze trends over time. Mobile Apps: Know how your apps perform across both smartphones and tablets. Video: Analyze viewing activity across the web. Ad Networks: Understand the complete reach of ads served through your network. Distributed Content: Measure the full reach of your content regardless of site ownership. How will my company benefit from participating? Companies who tag with comScore extend their exposure in the market and are seen – maybe for the first time – by media planners, advertisers, investors and others who use comScore data to inform critical business decisions on a daily basis. Tagging all your digital assets through comScore Direct ensures you, and the industry, see your complete digital footprint. Tagging through comScore Direct also provides inclusion in the forthcoming Media Metrix® Multi-Platform service, a ground-breaking syndicated audience measurement service that reports on digital media usage across platforms: computer (laptops, desktops), mobile (smartphones, tablets), and video. This new measurement service is the first of its kind to provide a fully synthesized, unduplicated view of audiences across multiple platforms in a unified interface. This new multi-platform view of audiences and behavior will not only better reflect the state of digital media today, but it will also enable comScore clients to optimize their media allocations and improve their digital business decisions. Interested in learning more about Media Metrix Multi-Platform? Contact a comScore representative today. How does tagging with comScore work? It's easy for publishers, advertising networks and content creators to participate in comScore Direct. After signing up through comScore Direct, participants receive the unique tags to place across their digital assets. Once tags are placed, comScore is able to view these calls on its consumer research panel in addition to measuring the direct server calls. This unique perspective allows comScore to validate that the tag calls are measuring activities consistent with its audience measurement methodology. comScore applies proprietary data cleansing, dictionary rules, and validation processes, and once validated the tag counts are used to set the usage levels by site, resulting in the audience measurement. Is there a cost to start tagging with comScore Direct? Anyone may tag their web pages and apps with comScore Direct for FREE. Access includes the ability to review your tag requests and monitor the coverage of your content. Access to Media Metrix, Video Metrix and Mobile Metrix, where you can view your Unified Digital Measurement metrics along with granular competitive insights and demographic reporting requires a subscription. If you are interested in finding out more about these subscription services, please contact our sales team. Tagging is free and easy! 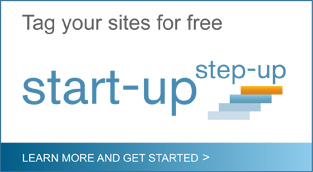 If you are already a current comScore, visit the MyMetrix user interface to get started. Not a comScore client, register here today. Interested in learning more about Unified Digital Measurement? Click Here to read more about comScore Media Metrix Unified Digital Measurement. Anyone may tag their website with comScore Direct for FREE. 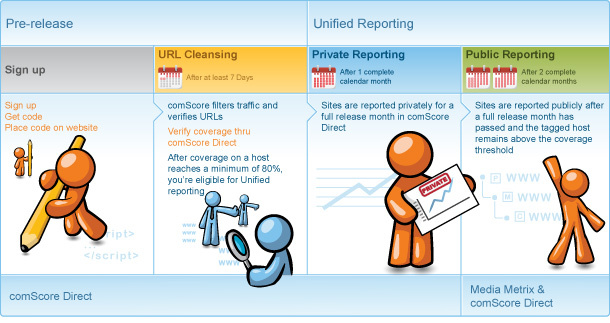 Access includes the ability to review your tag requests and monitor the coverage of your website. Access to Media Metrix where you can view your Unified Digital Measurement™ metrics along with other category reporting requires a subscription. If you are interested in subscribing to Media Metrix, please contact our Sales team. Click here to start tagging with comScore Direct.